I opened my newspaper this morning and found the headline below. Turns out, it has been in newspapers and online throughout the nation. 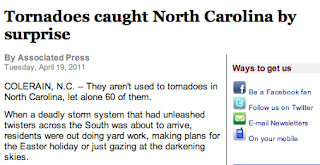 I can't say whether a given headline writer might have been personally "surprised" by the storms but the advance forecasts -- more than 24 hours before the first tornado touched down -- were excellent. I document just how good the forecasts were (and they were excellent) below. Just scroll down or click here. Meteorologists, in frustration, sometimes comment to each other that the sentence, "the ___________ (fill in the type of storm) struck without warning," seems to be preprogrammed into journalists' word processors. The fact is that modern weather science is providing life-saving and economy-boosting service to the nation every week. It would be nice if the media occasionally acknowledged that fact. Welcome Washington Post readers. Thanks for the link, Jason! Please feel free to look around the blog while you are here. There is a tornado threat developing in Missouri and Illinois Tuesday afternoon and evening. You are so correct. But "Residents had ample warning" doesn't sell newspapers or commercial time. I guess in warning they mean somebody from the government stops by to knock on each resident's door to warn them of the impending tornado. Well said. The forecasts may not have been heeded, but they certainly were available. We were told by Mike Maze of WRAL that our threat level for severe weather that day was higher than it had been since 1984. We knew exactly what we were getting ourselves into. 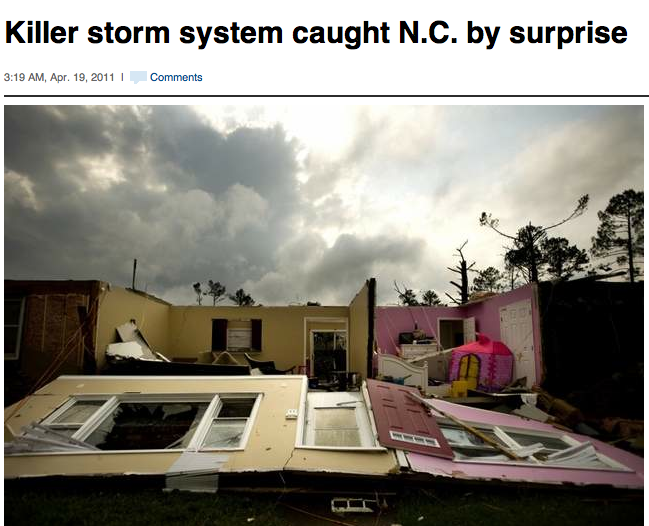 The meteorologists in our area did a supreme job in not only the forecasting, but in also in the storm coverage itself. I commend the work they did, and because of them I was able to find cover when the time was right. Not only that, we knew to the exact minute when the storm would be near a particular intersection. Weather forecasting has come a long way, and thank God we have the equipment to forecast these terrible events.